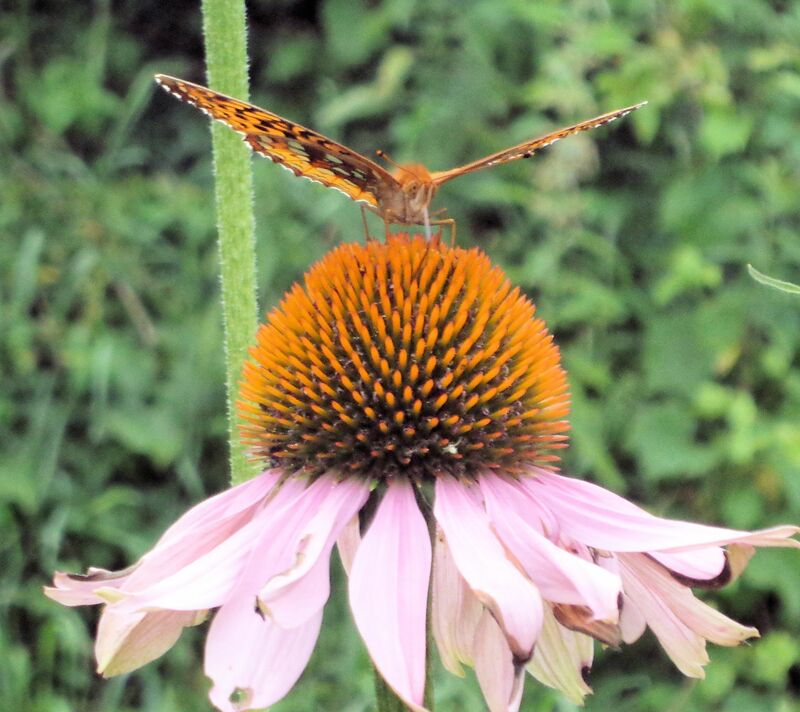 This whole month it seems I have blogged only about plants so why not round out July with some garden flowers and a butterfly? Here are a few of the flowers currently blooming in my gardens. 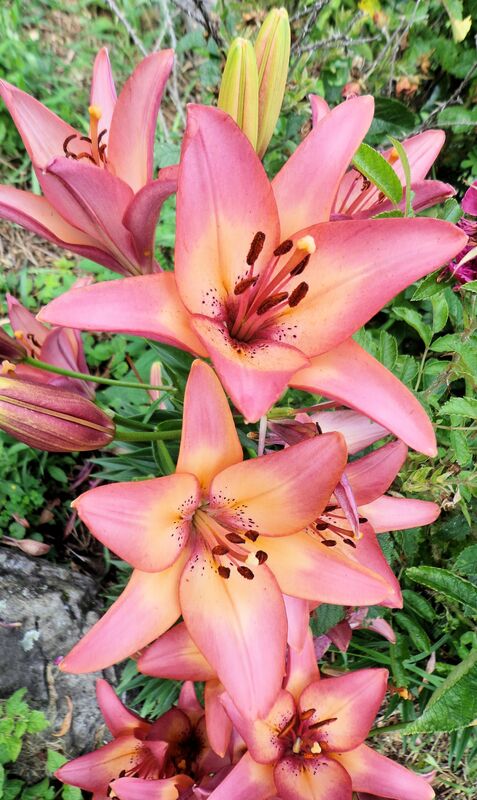 Above are beautiful salmon pink Asiatic lilies. In the same rock garden I have echinachea and a Bugnet shrub rose. The echinachea attracts hordes of bees and butterflies. 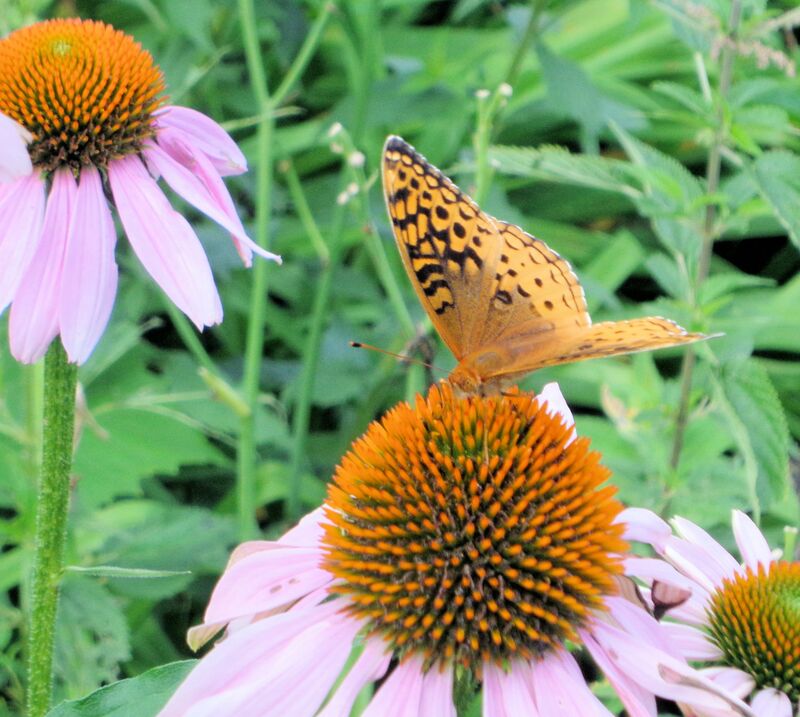 Here a butterfly I believe is the Great Spangled Fritillary sips at nectar. The Great Spangled have been very common here this year, the conditions must have been favorable for them. Their caterpillars feed on the leaves of violets and we have plenty of those. Where I have placed it, the balsam will not be able to spread very far. 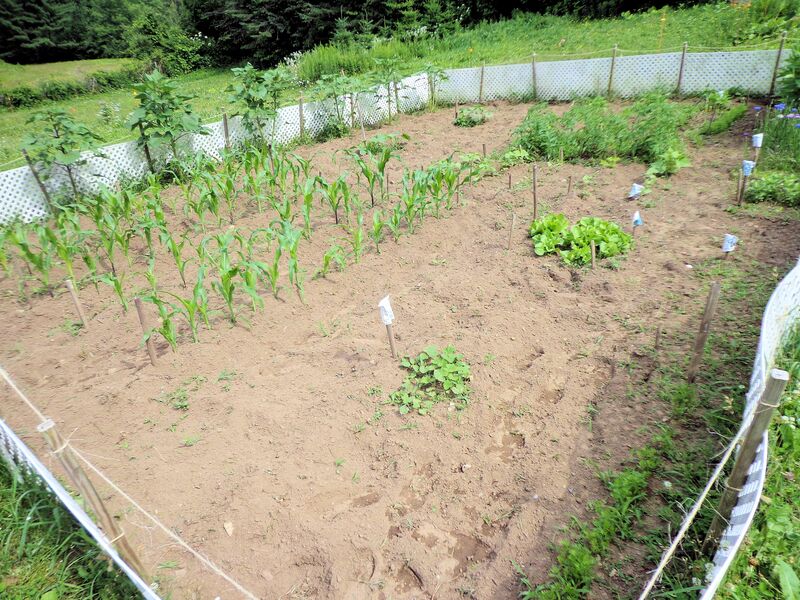 We mow around the whole area and it is unlikely the seeds will be carried beyond our yard to establish elsewhere. In Connecticut the plant is banned, but not in Maine. Here it seems to coexist and not become a big problem. I love the giant flowers, as do the insects. 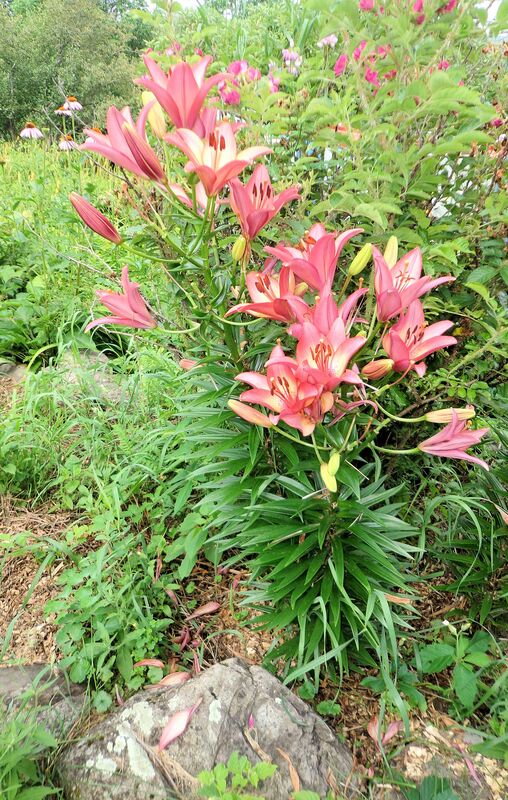 These plants produce copious nectar for the bees, butterflies and hummingbirds. 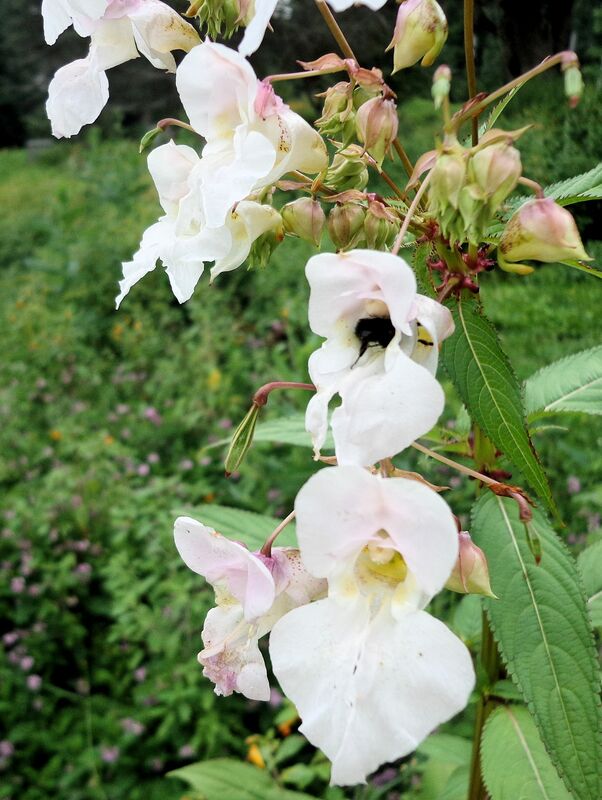 In the photo at right a wild honey bee is completely inside the flower. 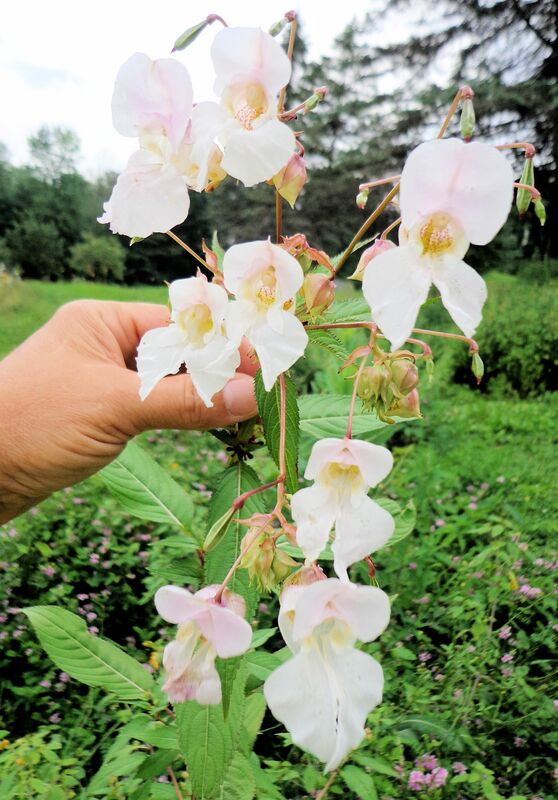 The plant is edible for humans and the flowers can be made into jam. They have a light, sweet scent. The balsam is growing on the edge of a patch of wild, native jewelweed and I will be able to control its spread by pulling unwanted plants. It will be necessary to monitor this flower to be sure it does not escape cultivation. 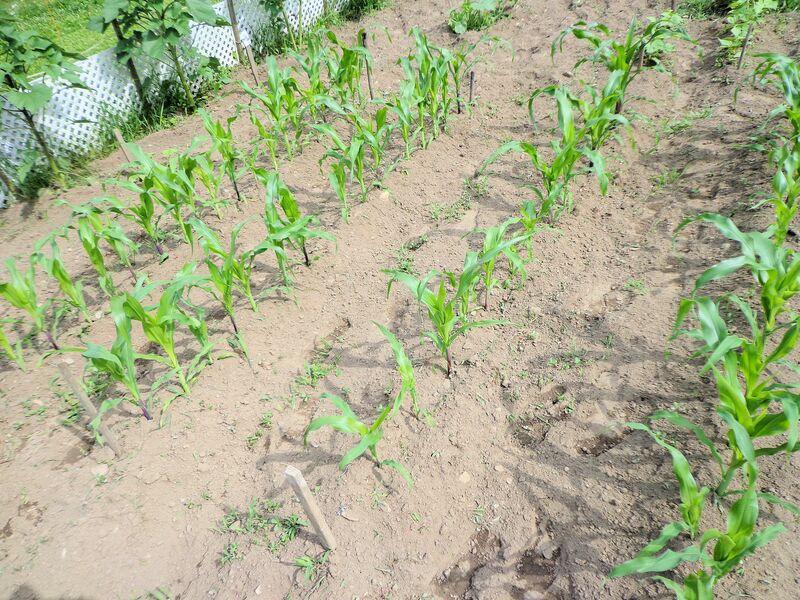 These plants grow wild in the unmowed areas of our farm. I decided to identify them because the little red berries they produce are intriguing. I wondered if they were edible. 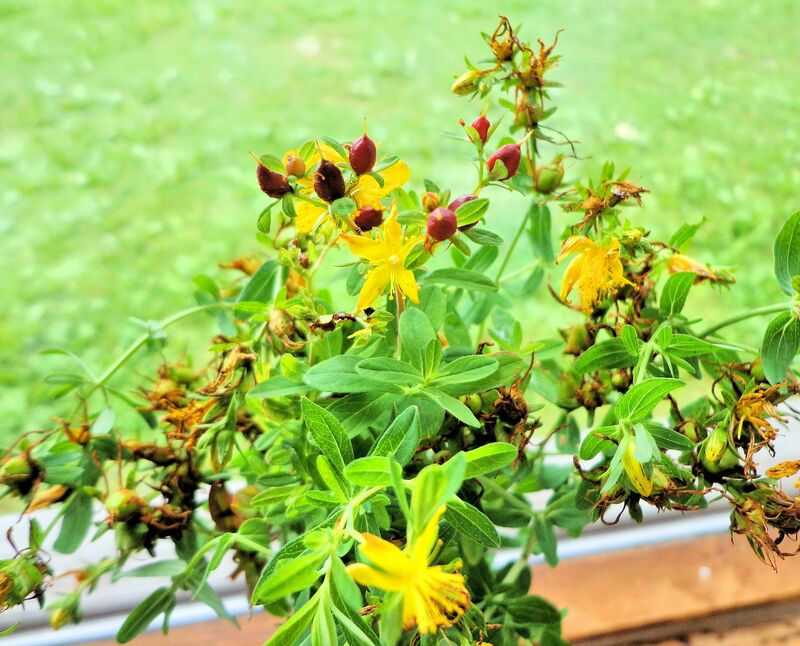 Turns out this plant is St. John’s Wort. 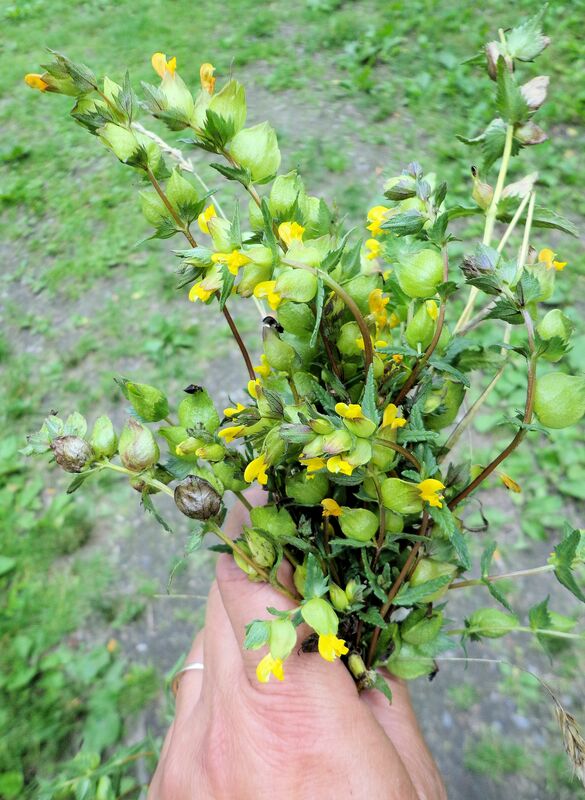 There are two native species in my bouquet: Hypericum boreale or Northern St. John’s Wort, a wetland variety, and Hypericum punctatum or Spotted St. John’s Wort that grows in drier locations. The boreale is smaller and near the center of the photo with the red berries. Its flowers are bright yellow and it is common in cranberry bogs. At first I mistook this plant for some sort of odd cranberry. The spotted variety has golden-yellow flowers. The leaves of both plants have tiny transparent pores. The pores are visible on some of the leaves in the foreground of my photo. I had difficulty telling the Spotted St. John’s Wort from Hypericum perforatum, Common St. John’s Wort, that thrives as an introduced plant in Maine. The spotted has more black dots and lines on the petals than the common. 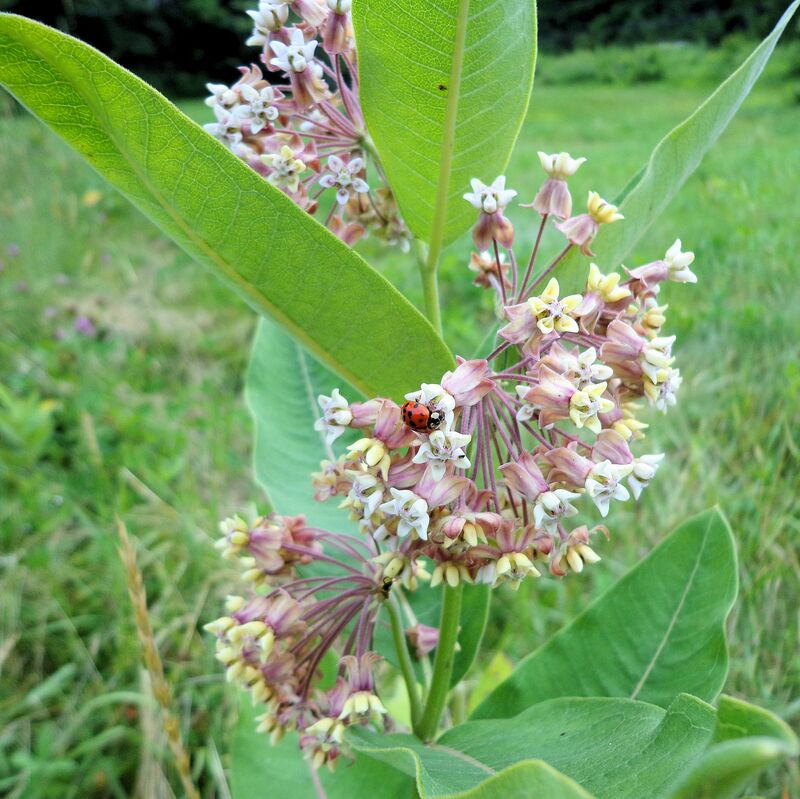 The plant is recognized for its medicinal qualities and is used as a remedy skin injuries and muscle aches, even depression. It is actually labeled as a poisonous plant because it contains strong compounds including an anti-inflammatory. Some are sensitive to the plant’s oil so care should be taken when handling. Crushing the flower leaves a reddish resinous stain on the fingers. The red juices contain the medicinal elements. The plant is recommended by herbalists to treat such a wide range of ailments that it sounds like a panacea. The flowers and tender leaves are infused in olive or other fine oils to create a red-colored medicinal oil. I will not be eating the little red berries the plant produces! Wild bees and butterflies thrive on the abundance of flowers from what many would consider weeds. Field flowers like clover, daisy, Black-eyed Susan, milk weed, aster, dandelion, bindweed vetch, and the flowers of the grasses provide a banquet of nectar and pollen to support the insects. Song birds also use the wild plant seeds and nectar and eat the insects. 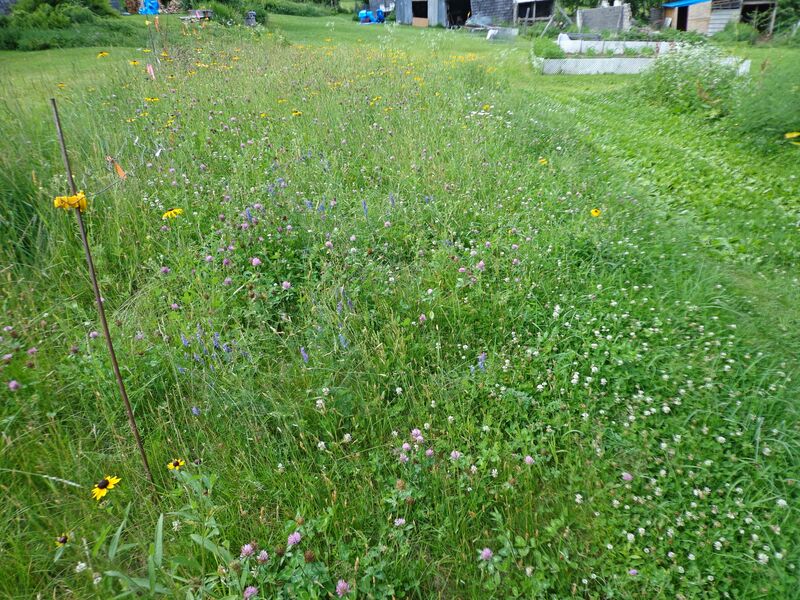 Compared to a wild field, a lawn is as sterile as a desert for the bugs. Cultivated flowers don’t produce the plethora of nutrients provided by wild plants. With the dire reports one reads of the decrease in the populations of wild bumblebee and other bees and butterfly populations, I’ve decided to dedicate areas on our farm for these insects. Places that are difficult to mow have now become insect sanctuaries. The steep side of our septic system has always been a problem to mow. I once had the horses crop it for me. 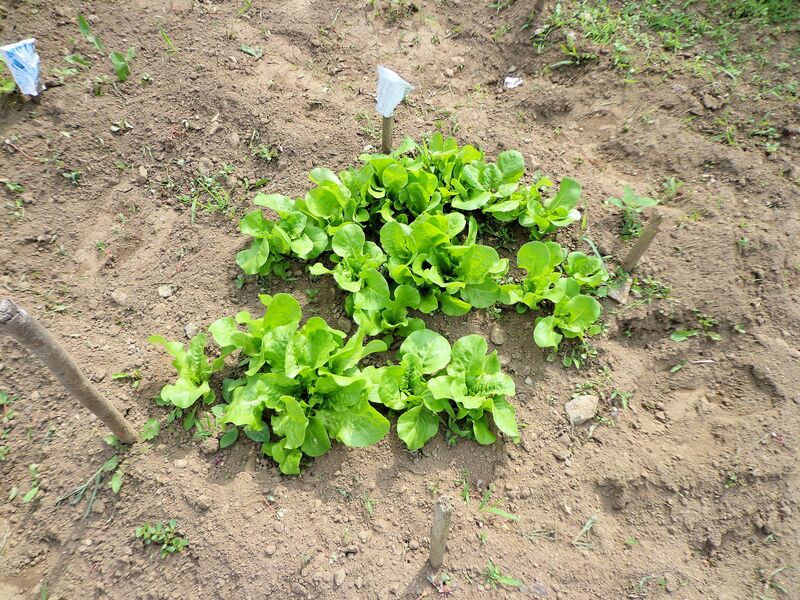 This year I fenced it so that the area was allowed to grow naturally. Wildflowers quickly filled the space. Another rough area is now dedicated to jewelweed, the hummingbird’s favorite flower. 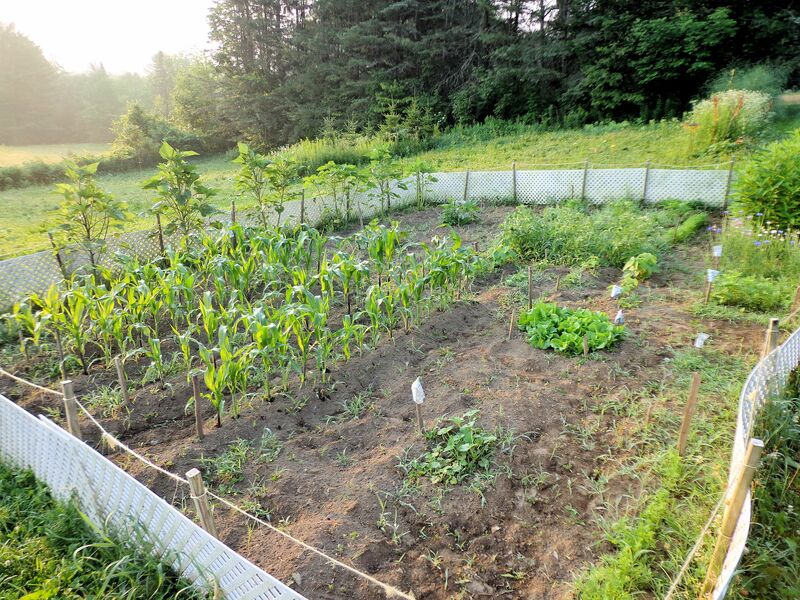 I also let wildflowers like milkweed, mullein, thistle and wild carrot grow along the fencelines and the edges of the orchards and hayfields. 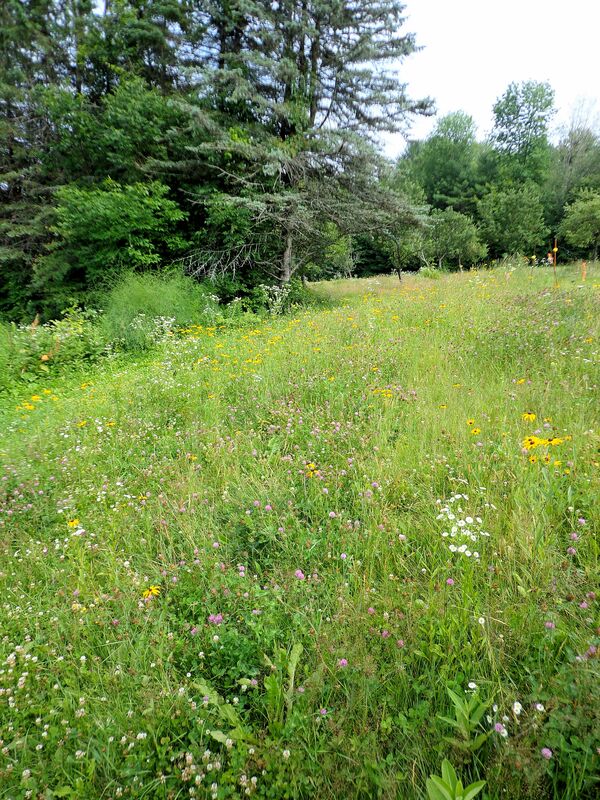 To produce hay, pasture and apples, grass and wildflowers must be mowed. But they do not need to be entirely eradicated. 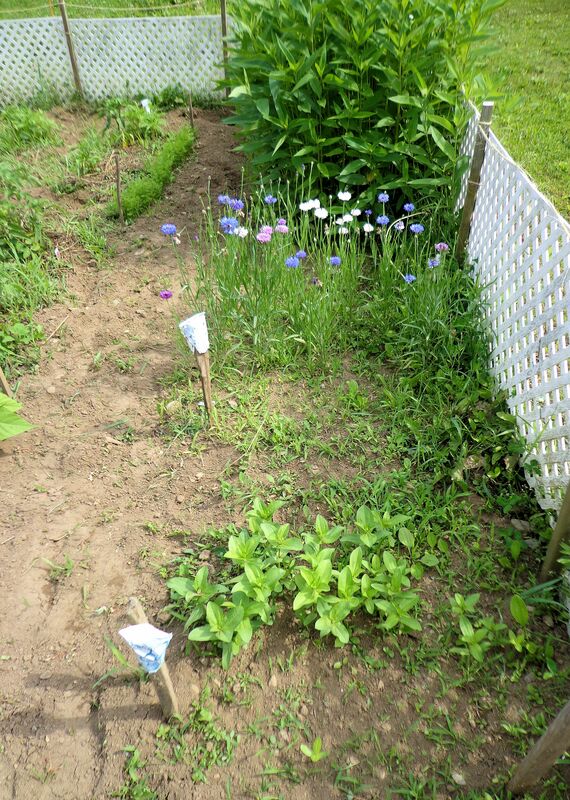 There is plenty of space around the edges for flowers and butterflies. 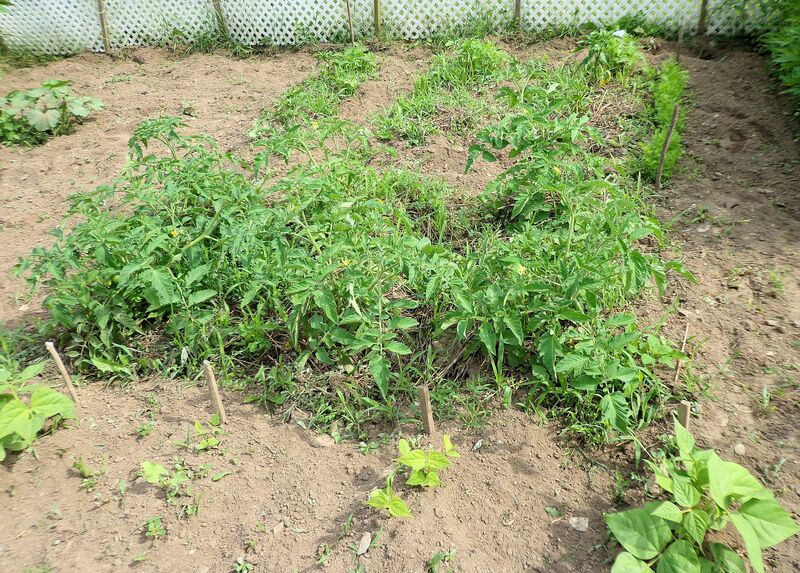 I wish all farmers, gardeners and lawn owners could find room for the wild plants and not pull all the weeds or dose everything with weed killer. My new fig tree has fruit! Today I was removing a dead leaf and spotted all these tiny figs forming. That was a surprise! I didn’t expect the tree to produce this year. I bought it this spring and it is about four feet tall. During the past couple months it has developed a mop of leaves at the top. Side shoots for lower branches are also starting to form. The tree appears to be very happy against the south side of the house. 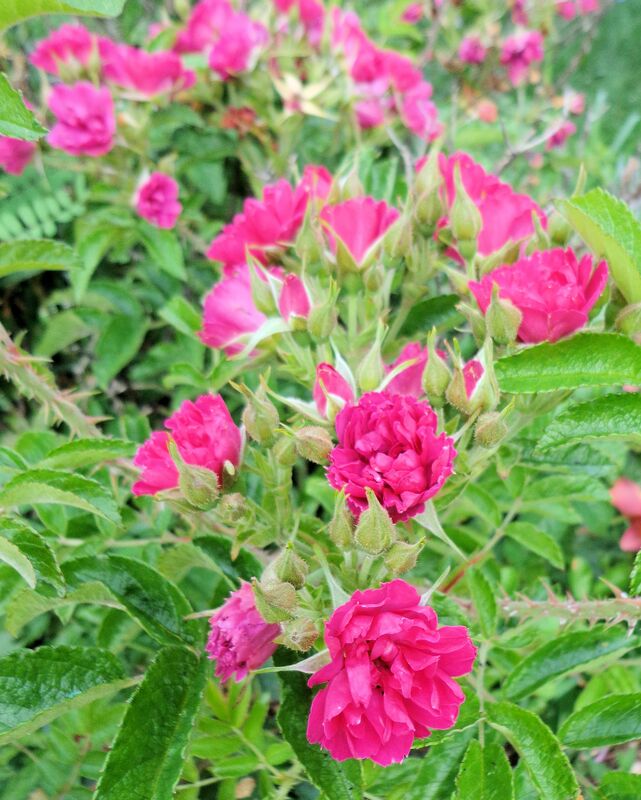 I planted some moss roses around the base and water regularly. 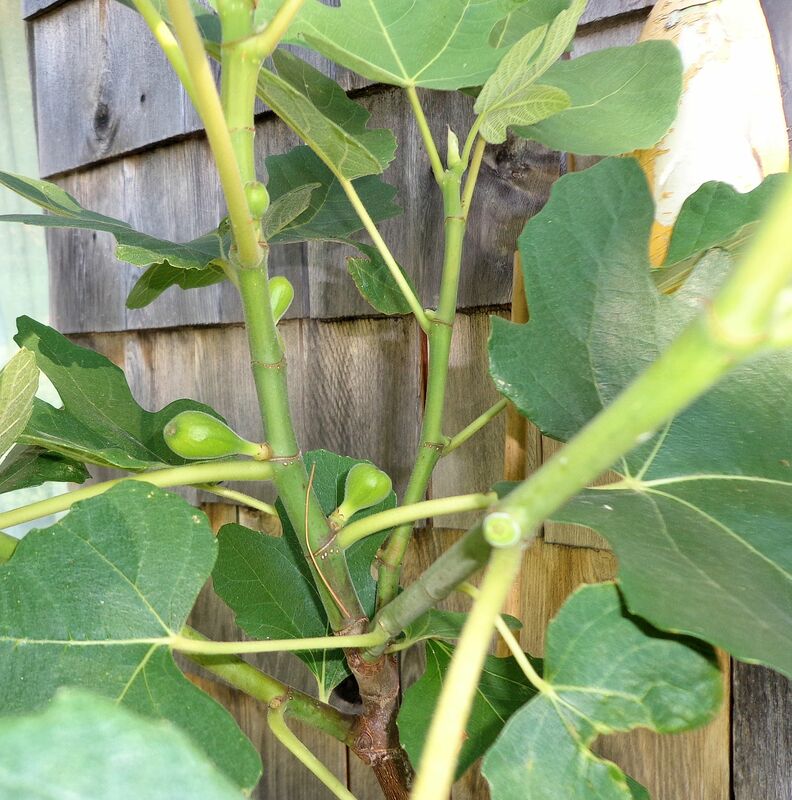 It’s so exciting to think there may be figs to eat this year! These fruit are forming without fertilization, called parthenocarpic. They occur as extensions of the stem and will not contain seeds, only flowering bodies. They will still be very yummy, and less crunchy. The “seeds” in figs (the true fruit of the plant) are not my favorite part for eating. 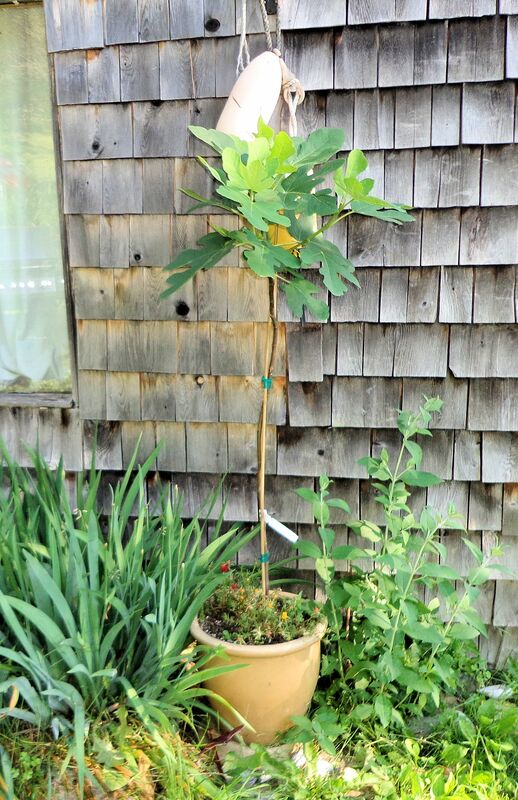 This winter I plan to house the fig tree in a cool room upstairs in my house rather than in the unheated woodshed. The baby fig I had last year got too cold out in the shed and died. Figs are supposed to be able to withstand temps down to 17F, but very young trees are more susceptible to cold. I am much happier with this older, taller tree than with the tiny baby from last year. This tree is old enough to make fruit!! Update on the Battle of the Rattle, my ongoing campaign to wipe out yellow rattle in my hayfields: the scales are tipping in my favor. After mowing the entire hayfield with the rotary mower in mid-June, I hoped the rattle would be defeated for this year. Surveillance proved otherwise. Plentiful rains after the mowing encouraged regrowth from the cut stems. Rattle sprang up and rejoined the fray. By last week, the parasitic plant was blooming all over the field. I have a new tactic, this one will be the decisive move of the war. 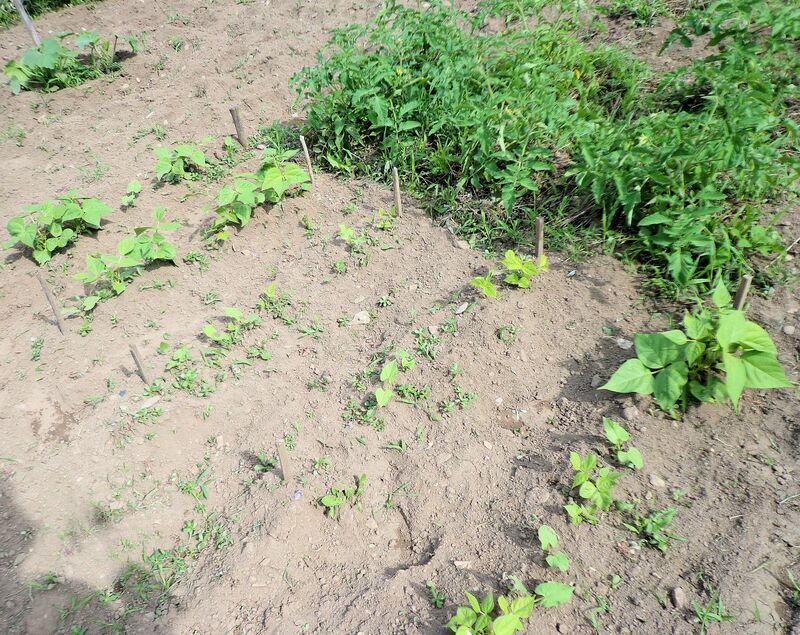 Methodically, by quadrant, I am sweeping the entire field and pulling the parasites by hand. The work is long, hard, hot and grim. Deer flies and mosquitoes buzz my head and attack any exposed flesh. The burning July sun beats down. My back aches from bending to pull the endless plants. I fill bags with the plant bodies and throw the casualties deep in the dark woods where they will never be seen again. So far I’ve cleared about one-third of the field. I’m not sure how big the entire area is, several acres, at least. 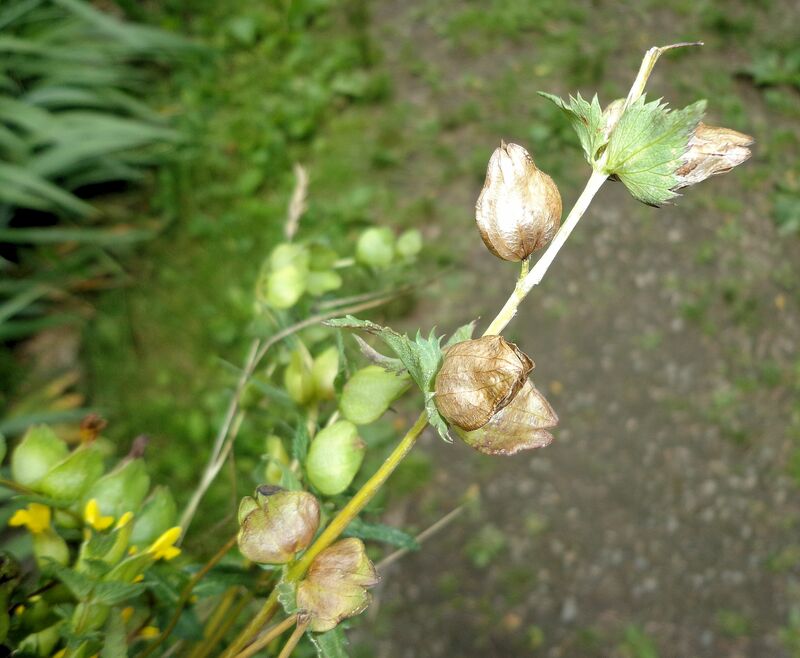 Yellow rattle is a rigid, brittle plant. To remove it from the ground, a gentle, steady pressure is applied. Pull too hard and the stem snaps. Pull just right and the entire puny root system comes loose. 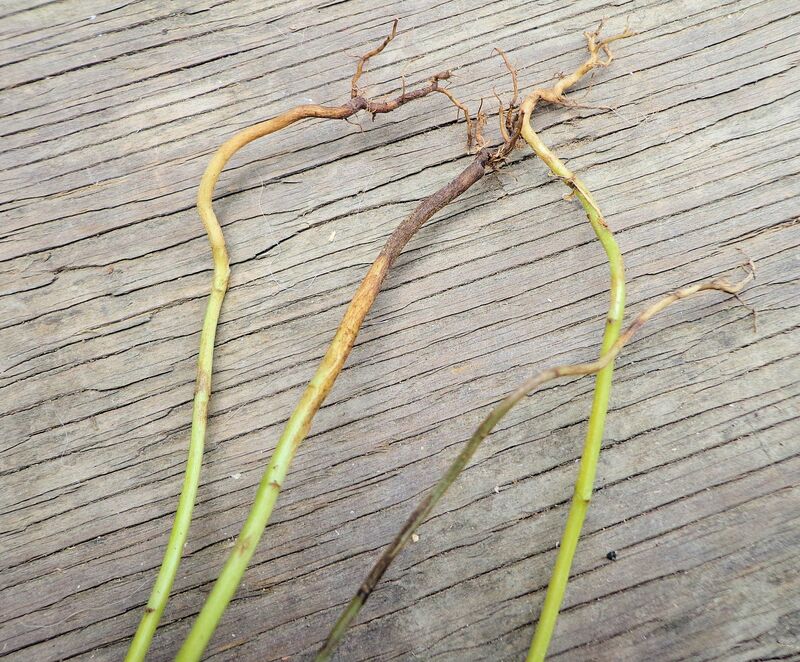 Rattle does not require a lot of roots since it gets nourishment by tapping into the roots of other plants. I use great care not to drop a single seed pod. Each pod contains twenty or more seeds. A dropped green pod will mature to papery-gray with loose seeds rattling around inside, ready to start a new generation of the weed. Removing rattle by hand will defeat the plant. The only threat that remains is seeds that got into the field in the last couple years. They can still germinate next year. I will be ever vigilant. If more plants show their miserable yellow heads next spring, I will be all over them, yanking them from the ground. Next year, I will not lose my hay crop. 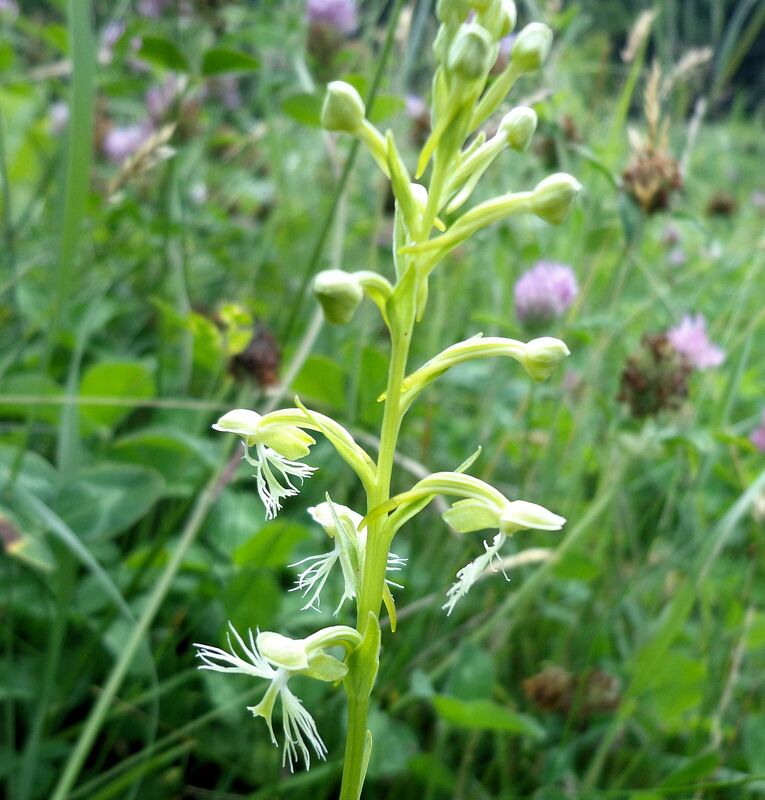 This time of year little orchids can be found blooming in the fields among the grasses and clover. They are green fringed orchids, Platanthera lacera. I found this one just opening its blossoms in the orchard. The plant stands about one foot tall. When the flowers are fully open the plant resembles a bottle brush. Lacera is Latin for “torn” or “ragged” referring to the whiskery labellum or petal-like lower part of the flower. 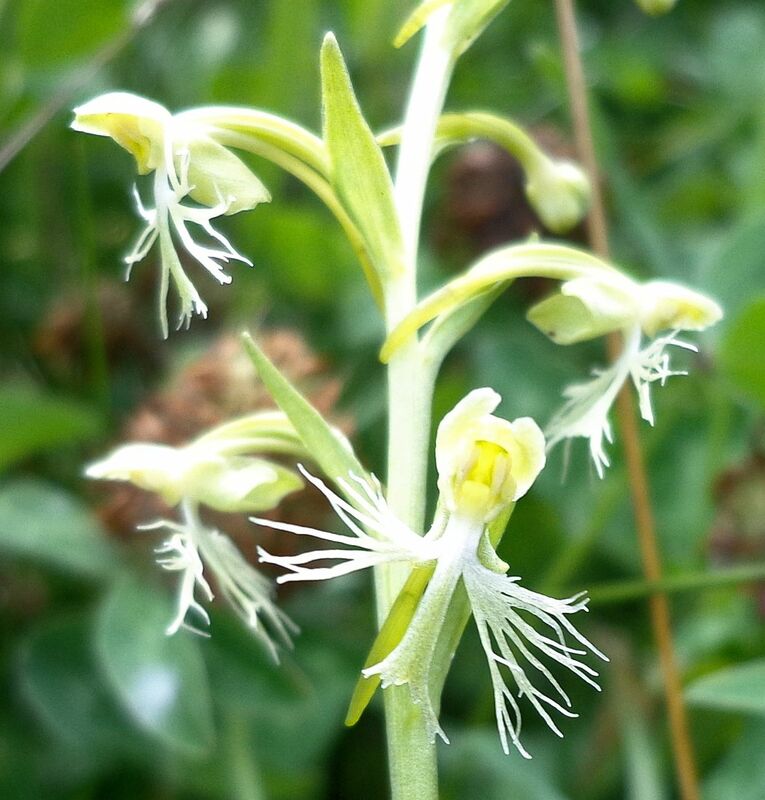 The green fringed orchid is a perennial preferring acidic soil. 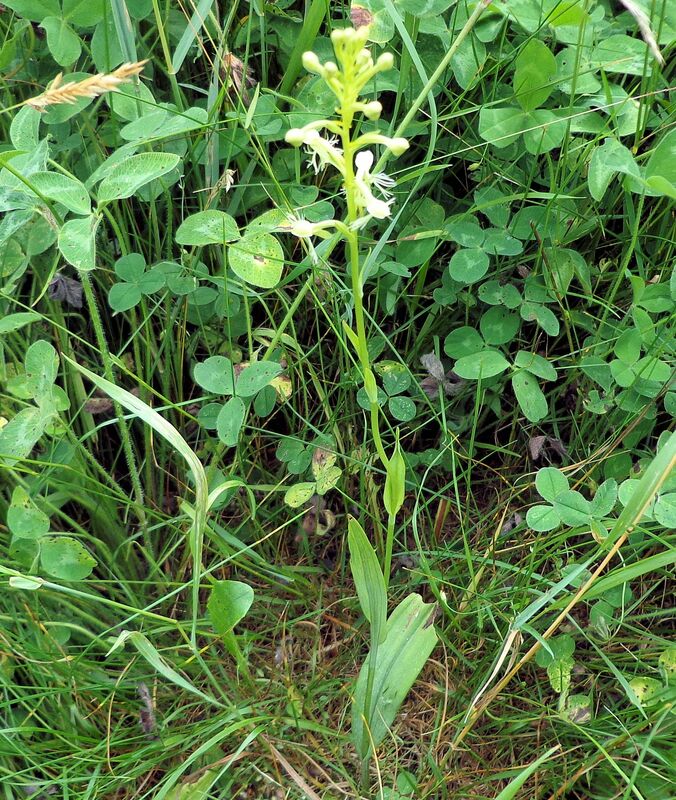 It grows in boggy to dry conditions and is a more common orchid of the northeastern US. I have found several in hayfields. Sadly, they tend to get mowed before they can bloom. We also have purple and yellow fringed orchids here in Maine, but I have never found them on our farm. The fringed orchids emit fragrance during the night that attracts moths, their pollinators. It always makes me happy to find one of these orchids when I’m out for a walk in the field.